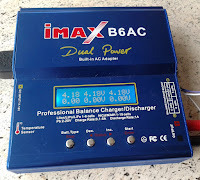 Since cheap (read: counterfeit) B6 chargers bought online on the internet cannot be trusted, you will find hereunder the results of my research to recalibrate my IMAX B6AC clone and make it a viable solution. 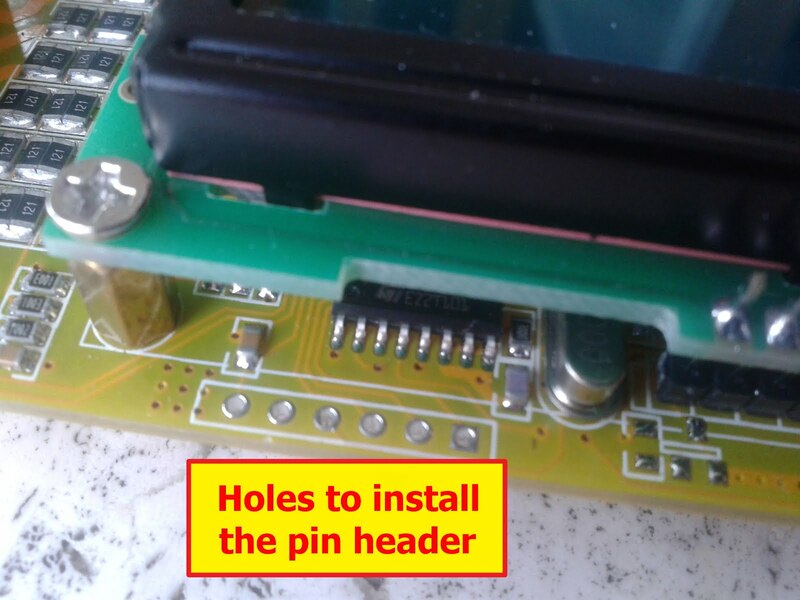 On forums, you can find lots of info about changing the voltage divider resistors inside the charger. This is totally counter-productive. If your meter is not precise, it only needs recalibration. 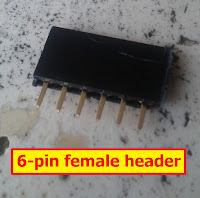 Changing these resistors by more precise ones (without recalibration) will only make your charger worse (since it has already been calibrated for the less precise resistors). Some people recommend using a 6s Li-po (or who 3s in series) to re-calibrate it. I also find it risky since you need a reliable way to charge it before re-calibrating your charger. 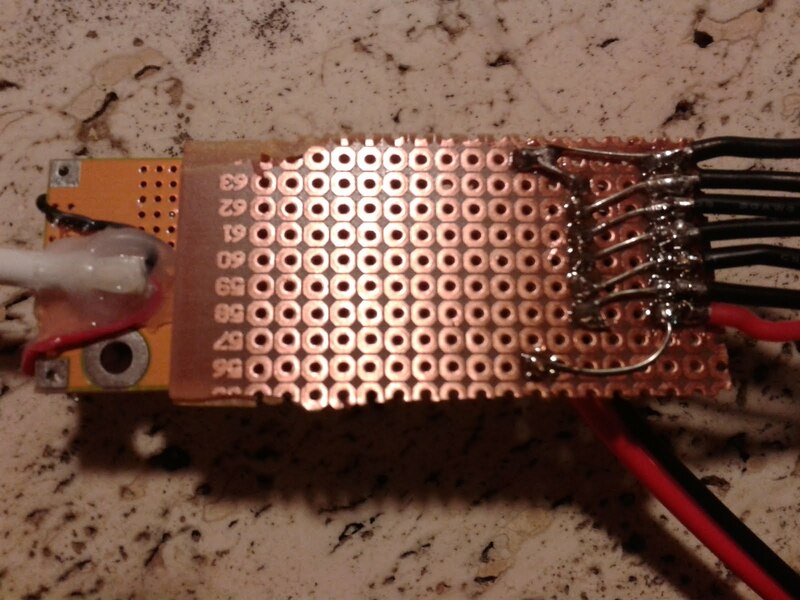 This forum post shows (see posts 27 and 28) how a voltage divider and a reliable voltage source can be used. This is the method we will use. Depending on where you got your charger from, it may or may not have been calibrated before. The firmware is conceived in such a way that the calibration process can be done only once. We are therefore going to hack the firmware to remove this limitation. This hack has been elaborated by Sp5, dusk and tolyan23 from RCGroups (less cryptic explanations here). You don't have to perform the hack yourself, it is already made and available on-line: we can download it directly from here (for some reason, he password protected his zip. The password is written in the post as well). 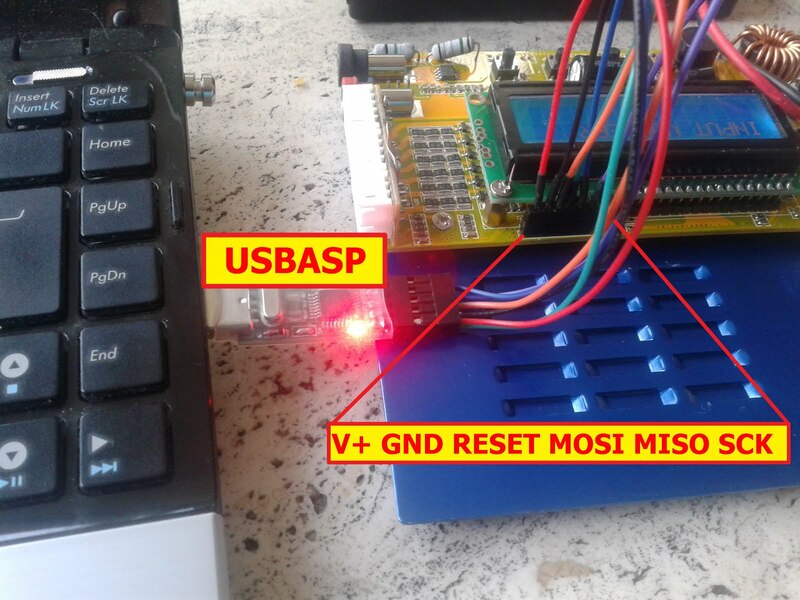 To load the new firmware you will need an AVR programmer (I'm using an usbasp), its drivers and avrdude. The first part is easy. 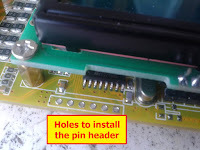 You need to solder the pin header to the programming port (holes) on your charger, see the image below. 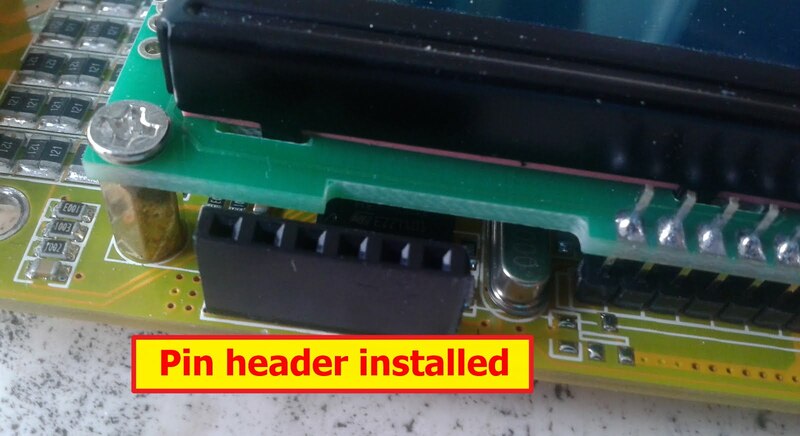 Now that the port is installed, we will need to connect the programmer (as shown in the image below). Location commencing from square place SCK MISO MOSI RESET GND V+ (from left to right when you hold the charger in its normal position which is the opposite from the picture). Note for beginners: SCK and SCL are the same thing. 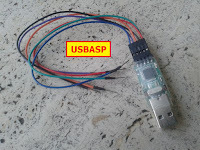 Note: you may need to replace the “usbasp” if you are using another one. More info on avrdude (syntax) here. Now that it's programmed, we can check the calibration menu comes up by pressing the button 1 and button 3 during the charger start-up. The calibration procedure will be described below. Note: If you calibrate it wrong, you can always recover your original eeprom values with the command above. So if we want to calibrate the B6 charger, we will need a precise calibration bench. Building these can be cheap, it is calibrating the calibration bench that will be a little more tricky. The bench I made is based on the schematics I found here. 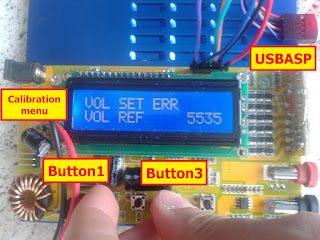 Precise voltmeter is needed to adapt the output voltage to 25.2v (or 25.19). 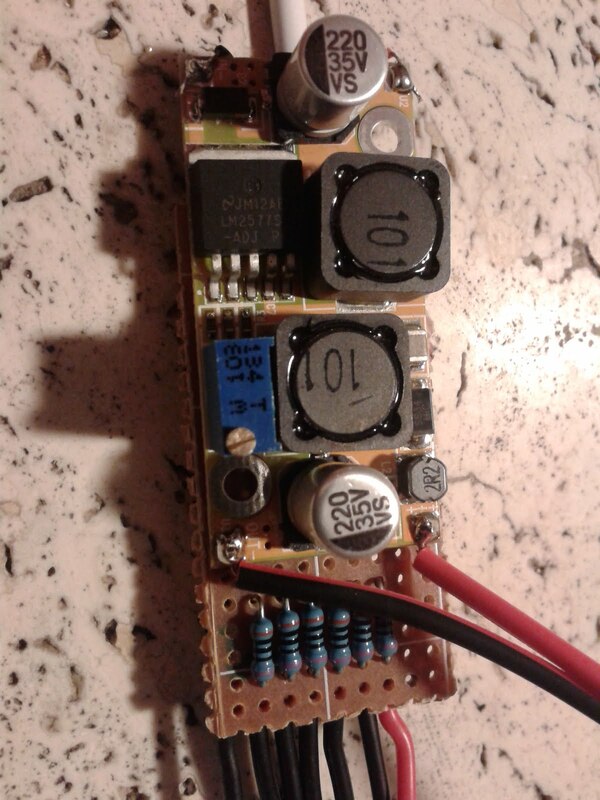 Please be careful, cheap multimeters are far from precise enough (some can be off by a couple of volts !). 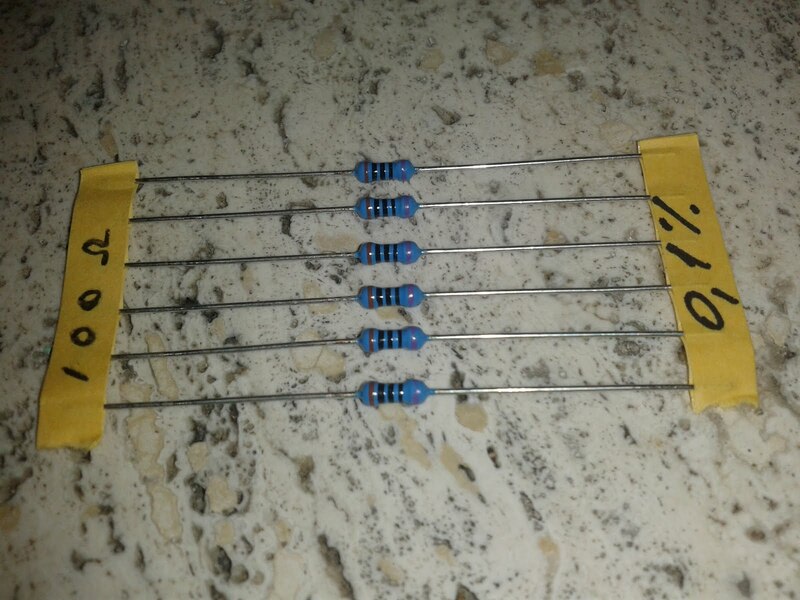 100 Ohm 0.1% resistors. If you look on ebay, search for '100R'. 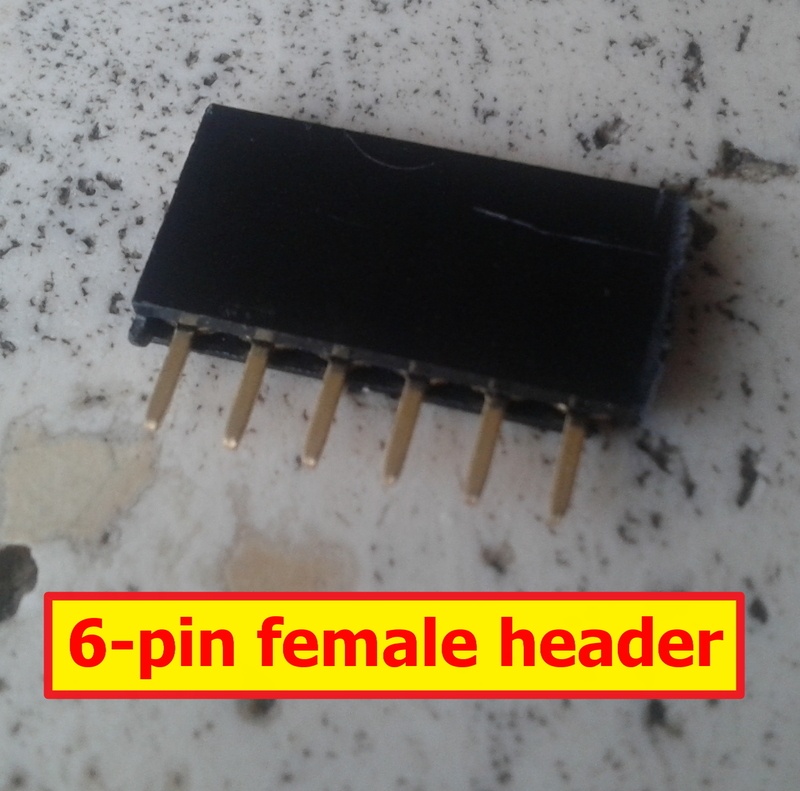 Just make sure the precision is 0.1% since they will be used as a voltage divider to simulate 4.2v cells. To build the calibration bench you will need to connect the usb male plug to your dc voltage booster input. 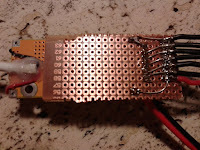 The output needs to be connected to the banana plugs (mind the polarity) and to the balance connector: connect the red wire to the + and the last black wire to the -. 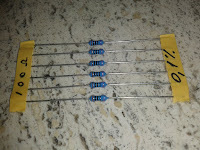 Finally connect all your 100 ohm 0.1% resistors in series between these wires (+ and -), connecting each of the balance wires between each resistor pair (it will all be simpler if you have a look a the diagram below). With all this assembled, you need a precision multimeter to adapt (there is a screw on the dc converter, see the diagram above) the output voltage to 25.2v precisely (25.19v is even better). Make sure you adapt the voltage with the circuit connected to your charger since the data acquisition chain of your charger might impact the output voltage (it should not but might anyway, we're talking about a cheap dc converter after all). 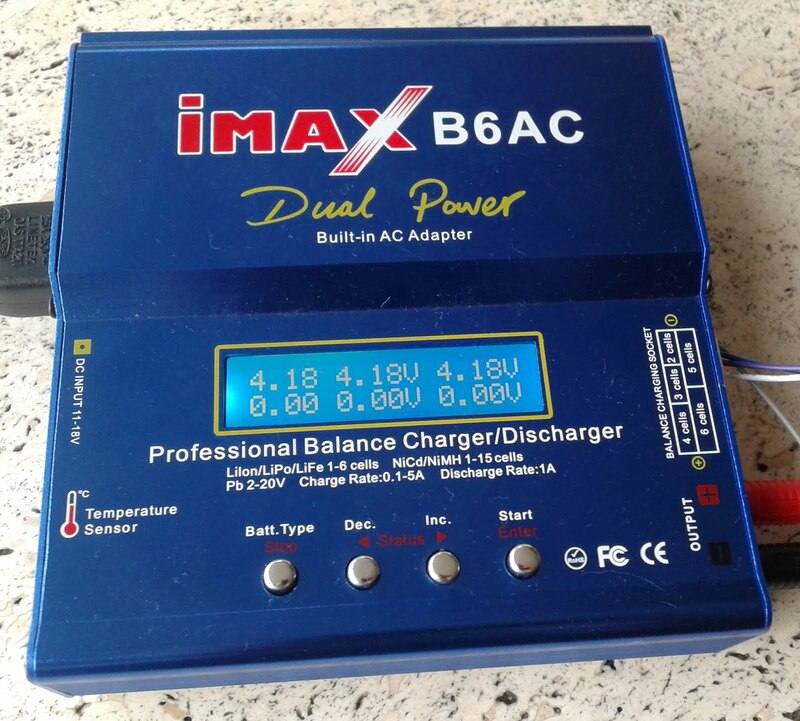 Now that your calibration bench is ready, connect your bench to a usb socket, the banana and balance plug to your charger (make sure the male banana plugs do not touch each-other or anything when plugging the USB). Hold the button 1 & 3 of your charger while powering it, your charger will automatically recalibrate the balancing circuit. Once it's done, switch it off and power it while pressing the 2 & 4 buttons. Using the up and down buttons set the voltage value to 25.2v and press enter. Nice post - thanks for sharing the details! If your calibration kit hasn't already sold, I'd be very grateful for it - and agree to sell it on to the next person. Thanks for your compliments. Since you're the first to answer, I can send it to you. Could you please send me your details (so I can check the shipping costs from Belgium). 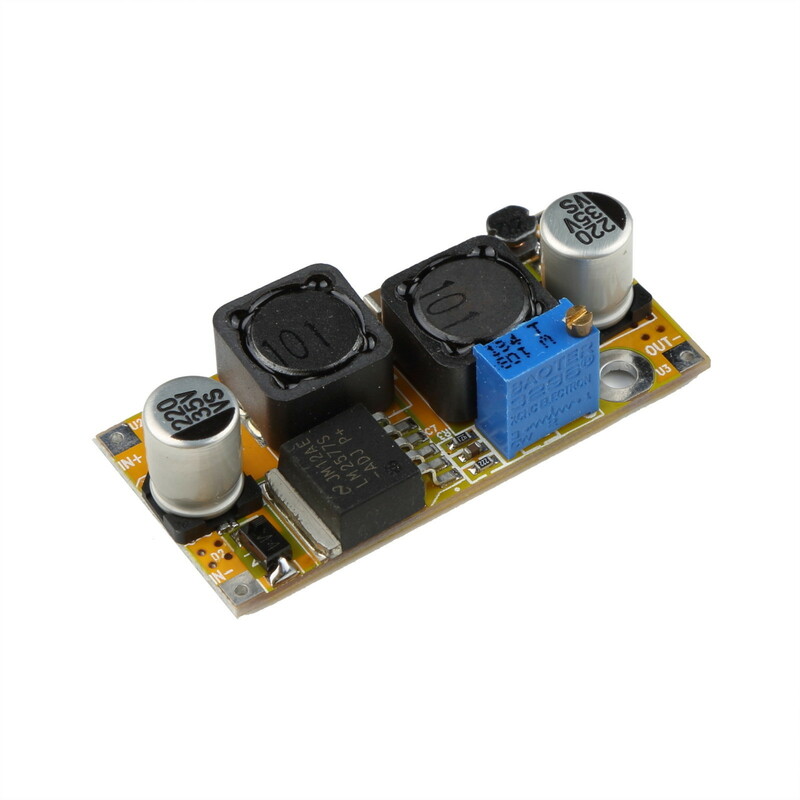 - you will need a precise multimeter to choose the appropriate output. Great work Martin. I have 3 off these chargers but 1 has a strange problem. It charges 3 cell lipo's fine like the other 2 but as soon as i charge a 6 c it will just stop after like 6-7 min. I can charge 6 c with the other chargers just fine. Its nit giving any error when it stops but just stops in the lipo menu. I checked the heat off the charger but its not getting hot, just handwarm like the others when charging a 6 cell lipo. You have any idea what this can be ? Not really :-/ Have you checked if the power supply delivers enough juice? 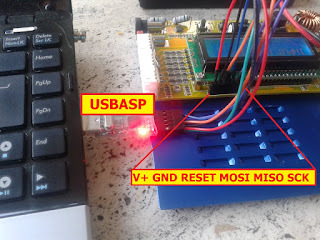 If not, there could be a voltage drop at some point which could reboot the microcontroller? (this is just a theory). 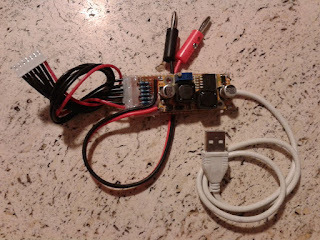 Have you tried with another (external) power supply?